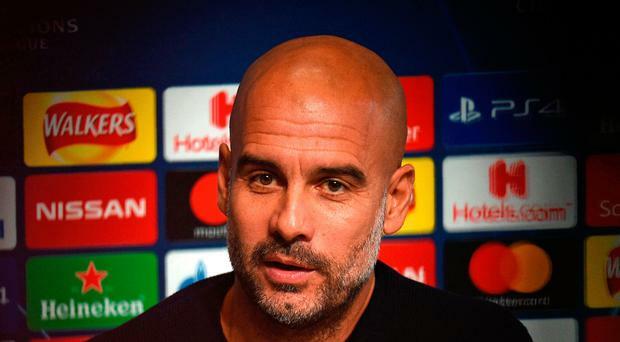 Pep Guardiola believes Manchester City's Champions League clash with Shakhtar Donetsk tonight is more important than Sunday's derby against Manchester United. City are looking to take another stride towards qualification for the last 16 in the European competition by repeating last month's victory over Shakhtar in Ukraine on home soil. Guardiola insists the game is currently his sole focus and is not yet looking ahead to this weekend's more-hyped Premier League contest. The City manager said: "Every game is important and you have to evaluate. The most important will be Shakhtar, first because it is the next one and second because it is a final. "After dropping points against Lyon, every game is a final. We have a big chance to make an incredible step to qualify for the next round, and after we have three or four days to think about United." Guardiola said: "Every game is completely different. We have a big chance to go to the next round. We feel more comfortable playing home than away and I prefer to play here than in Donetsk, for example." City have been eliminated at the last-16 stage and the quarter-finals in Guardiola's previous two seasons in charge. The Spaniard, who won the competition twice as Barcelona boss, feels success is now tougher to achieve than previously. He said: "People say it's not enough but, in my opinion, to reach the quarter-finals is already a big success today. "Big clubs are going to be out, they're not going to qualify for the next round, so going through is already a big achievement. "My feelings from playing in it 10 seasons ago is every season it's tougher. The teams are stronger, more well prepared - wherever you go the opponent is tough." Kyle Walker, who was speaking alongside Guardiola at City's pre-match press conference, claimed the players were responsible for rousing the crowd. City are regularly criticised for a lack of atmosphere at Champions League home games but Walker insists the fans are not to blame. The right-back said: "Definitely not. The fans have their opinion on the Champions League which is what it is. "It is down to us as players to create the atmosphere in there and help the fans." Walker was also asked why he cuts holes in the back of his socks. "I get tight calves with my age," he said. "I do that to relieve a bit of pressure."